Welcome to Brett Murrie Naval Architecture & Marine Design! 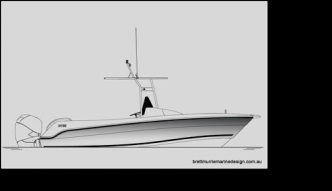 Brett Murrie Marine Design is a consultancy based in Brisbane, Australia, specialising in the design and project support of vessels constructed (mostly) from aluminium and composite materials. Our design history includes numerous powerboats, catamarans, rigid inflatables, workboats, sportsfishers, pleasure boats and yachts from 5 metres to 30 metres in length for commercial and private clients. A milestone for one of our clients with the hull mould released from the plug for a new 7meter centre console. This hull features a 21 degree transom deadrise and wide chines for a smooth dry ride. Shoal draft design includes streamlined lead bulb, propeller shaft tube and integral fresh water tank. All CNC kit construction. 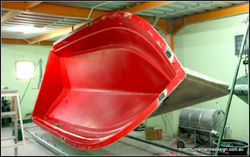 March 2011 - 7m FRP Monohull.